S., Eva (2001) Hubungan antara penerimaan diri dengan kesepian pasca stroke berat. Skripsi thesis, Universitas Tarumanagara. the physical and psychological conditions of patients of stroke often carry negative psychological impact on them. They tend to experience shame, low self- esteem, losing self-respect and self-confidence. lf these condition remains, gradually the individuals may experience depression. Depression prevents individual to accept the self. Difficulties to accept the self may cause the persons to feel insignificant alienated and abandoned. These conditions trigger the feeling of loneliness. Self-acceptance is very important for patients of stroke. They should not be petrified by the fact that they have more limitations, but they need to realize that they still have much potential to overcome feelings of loneliness. 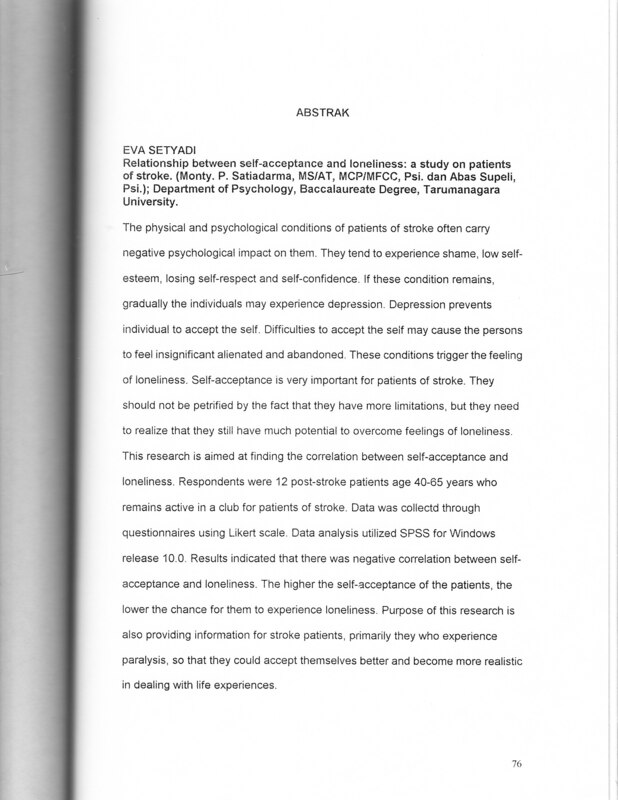 This research is aimed at finding the correlation between self-acceptance and loneliness. Respondents were 12 post-stroke patients age 40-65 years who remains active in a club for patients of stroke. Data was collectd through questionnaires using Likert scale. Data analysis utilized SPSS for Windows release 10.0. Results indicated that there was negative correlation between self- acceptance and loneliness. The higher the self-acceptance of the patients, the lower the chance for them to experience loneliness. Purpose of this research is also providing information for stroke patients, primarily they who experience paralysis, so that they could accept themselves better and become more realistic in dealing with life experiences.